A new report on “Social Media and Young Adults” by Pew finds several interesting trends, the most pronounced of which is a decline in blogging. Wirelessly connecting in general, though, continues to rise among teens and young adults. Teens particularly disdain Twitter, to which those over 30 continue to flock. And in a bad sign for Facebook, users are now equally split between over-30s and under-30s. That finding holds up in the sample of my household, where the half that is in college grows less enthusiastic about Facebook while the older segment finds itself battling obsession. We’re already seeing clear indications among the younger half that Facebook use is growing hopelessly passe. 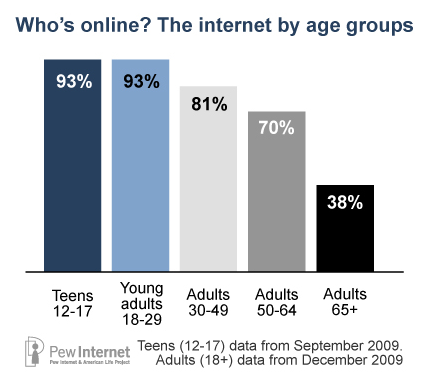 The study shows that online activity is near saturation points among the under-30s, while I was surprised that far less than half of those over 65 are online. I’m sure that curve will flatten rapidly, but it still is cause for consideration in communications strategies aimed at wide demographic groups. If you watch television, especially cable news channels, you see this bar graph reflected in the kinds of advertisements and programming on television. Television seems every day to skew more toward an increasingly older demographic.